Galle, Sep 11 (PTI) India produced a clinical performance to register a convincing nine-wicket win over Sri Lanka in the first ODI of the ICC Women's Championship here Tuesday. 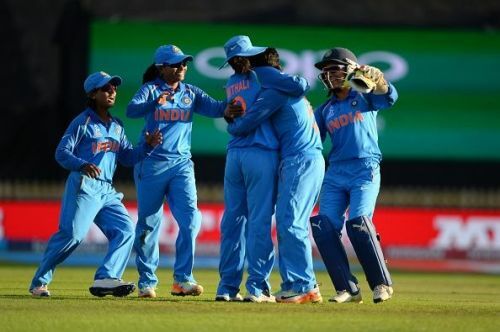 India women produced an incisive bowling effort to bundle out Sri Lanka women for a meagre 98 in 35.1 overs after the home side opted to bat first and then chased down the target with consummate ease, reaching 100 in 19.5 overs for the loss of just one wicket. Medium pacer Mansi Joshi (3/16) and veteran Jhulan Goswami (2/13) wreaked havoc at the top. Besides the duo, Poonam Yadav (2/13) picked up two wickets for India. The spin trio of Deepti Sharma (1/16), Rajeshwari Gayakwad (1/18) and Dayalan Hemalatha (1/19) also chipped in with wickets. Skipper Chamari Atapattu top-scored for Sri Lanka women with a struggling 93-ball 33. Chasing the paltry target, the Indian openers -- Punam Raut (24) and Smriti Mandhana (73) -- looked at ease as they stitched 96 runs for the first wicket to seal the match for their side. But just when it seemed India women would reach the target unscathed with just three runs to win, Raut was dismissed. Mandhana starred with the bat for India women, scoring her runs off 76 balls and hit 11 boundaries and two sixes in the process.